Vlans 1-3 are encapsulated into VLAN 10 between Switch A to Switch C.
Enter interface configuration mode and the interface to be configured as a tunnel port. This should be the edge port in the service-provider network that connects to the customer switch. Valid interfaces include physical interfaces and port-channel logical interfaces (port channels 1 to 64). Specify the default VLAN, which is used if the interface stops trunking. This is VLAN ID specific to the particular customer. Set the interface as an 802.1Q tunnel port. 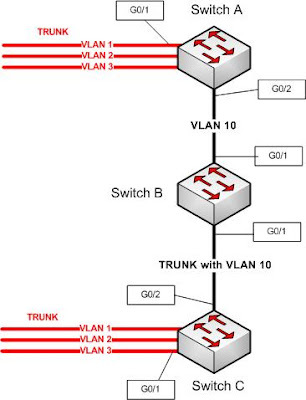 (Optional) Set the switch to enable tagging of native VLAN packets on all 802.1Q trunk ports. When not set, if a customer VLAN ID is the same as the native VLAN, the trunk port does not apply a metro tag, and packets might be sent to the wrong destination. Display 802.1Q native VLAN tagging status. Depending on the switch you're using, dot1q will be enabled by default. The double tagging occurs when the packets enter Switch B (from Switch A). Before egressing Gi0/2 of Switch B, the packets only contain VLAN tags from the CE trunk (VLAN 1,2,3).